That was one FAT Tuesday! Last year, I wrote a fairly popular article about Mardi Gras. 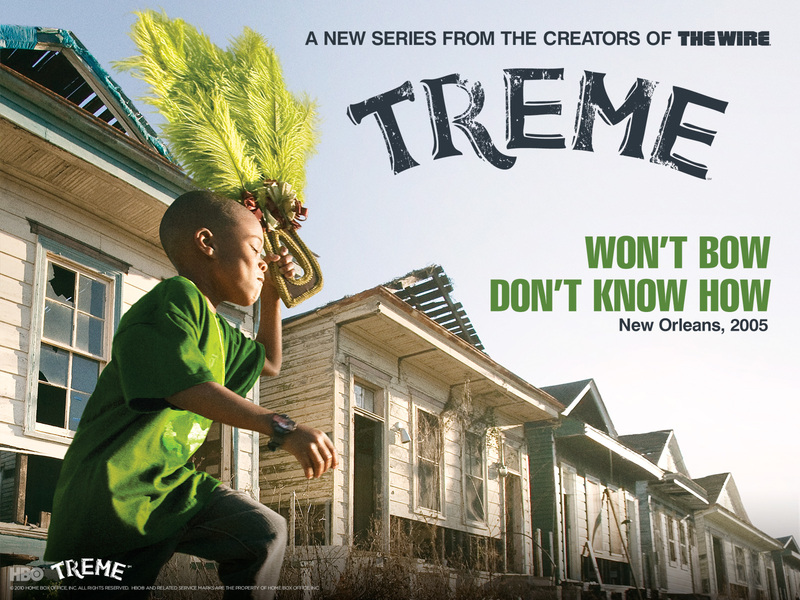 In it, I talked about the HBO series Treme, my attraction to the city of New Orleans, the history of Mardi Gras celebrations there, and the story of my first attempt at making a New Orleans King Cake. It was really quite informative and pretty entertaining. (In case you missed it, that was a plug for you to go read it. Go ahead … you can get to it from here.) The article got a lot of hits this Mardi Gras season, too, apparently from people searching for the correct way to pronounce “Laissez les bons temps rouler!” — that infamous Cajun expression that absolutely no one says in France … except for Americans! To be honest, last year’s attempt at making a New Orleans King Cake here in France bore almost no resemblance to the real thing. Since we didn’t have an oven, we had to depend on the local bakery for our brioche, and they just don’t make brioche here in Paris in the form of a ring or crown. On top of that, we couldn’t find colored sugar or the right food colorings at the local supermarket, so we improvised with candied fruit. And in place of the little plastic Baby Jesus, we used a ceramic Virgin Mary, the fève from one of our several galettes des rois from the Epiphany season. 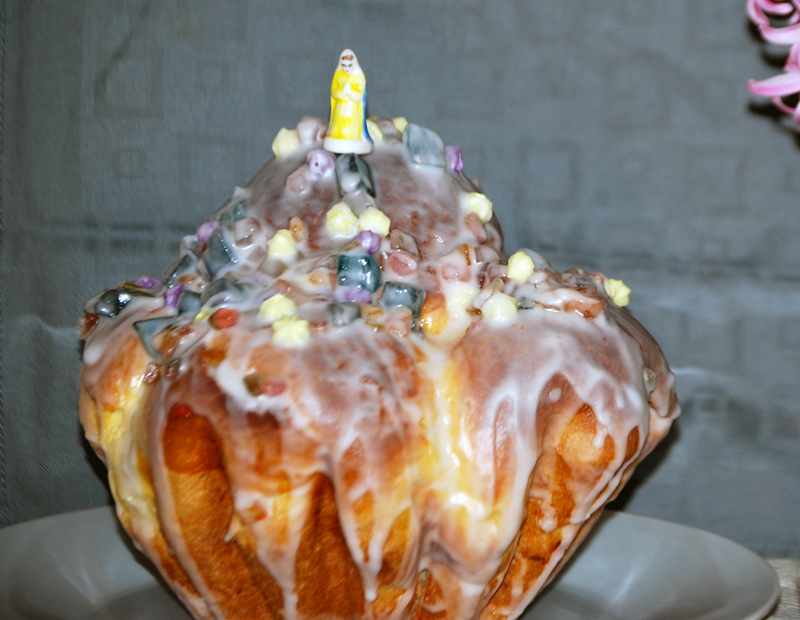 The result — as delicious as it most certainly was — looked more like a shrine to Our Lady of Candy Land than a King Cake. This year, I tried my hand at it once again, and the result was a much better approximation of the real thing. Continue reading That was one FAT Tuesday! an American can find in Paris! Back in July, you see, a blogger friend embarked on an epic a quest to find the best cupcakes in Paris and document the results for the world. Incidentally — perhaps fortunately for me — this all came about when I was also embarking on an epic quest … to lose the 25 pounds I’d packed on since coming to live in France. (Blasted croissants!) I say “fortunately” because I was forced to indulge vicariously in my friend’s cupcake caper … instead of following in her wake and packing on yet another 5 pounds! “Hmm. Interesting. It would make a good appetizer. You know, with a side salad,” was my sister-in-law’s reaction. Alrighty then … no more pumpkin pies for the Frenchies. 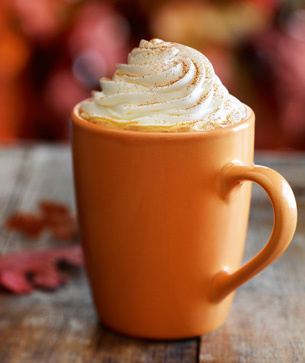 Continue reading Pumpkin Spice! The French and wine. What can you say? They go together like a horse and carriage, right? 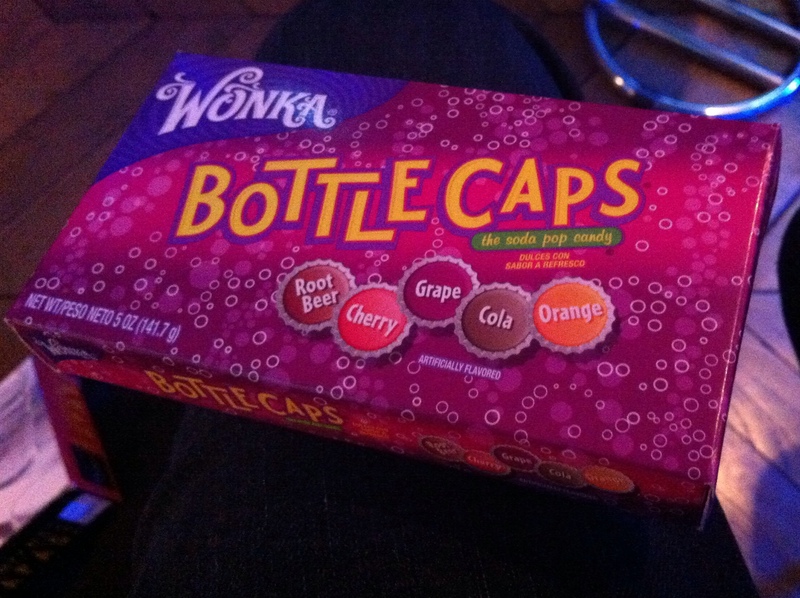 In fact, after the Vatican City (communion wine?) and Luxembourg (which everyone overlooks), France is the country with the highest level of per capita wine consumption at almost 46 liters (12 gallons) a year. (By comparison, the United States’s per capita consumption is less than 10 liters, or 2.5 gallons, a year.) The French also produce more wine than any other country: over 4.6 billion liters (1.2 billion gallons) in 2010! 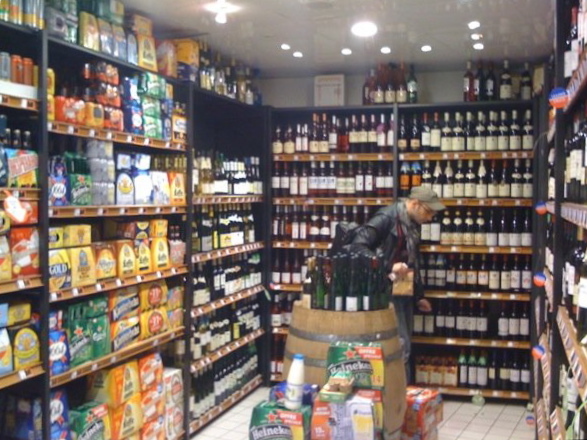 The wine section of a Paris convenience store. Notice how it’s 3 times bigger than the beer section. We all know, too, that the quality of French wine is superb. No country becomes known for its wines without a long history of top-notch products. But we Americans also know how to make some exceptional wines (even if we don’t drink them up at the rate the French do). I sometimes point out that the best pinot noir in the world comes from Oregon’s Willamette Valley. (Don’t get me wrong — I’m no wine connoisseur or anything. It’s just that I’ve read that tidbit somewhere, so I try to sound as authoritative as possible when I repeat it to French people.) And, of course, you’ve all seen the movie Bottle Shock, right? Bottle Shock — “Le Choc … de Bouteille“? The movie about how a Napa Valley chardonnay beat the pants off the best French wines in a blind tasting by a panel of Parisian judges? Oh, was that censored in France? Continue reading Laissez les bons temps rouler! What is it with the French and Peanut Butter? Living in France, you quickly take note of the big cultural differences: the French speak French, they complain about everything almost as much as I do, they have a knack for nonchalance par excellence (which I’m still working on acquiring), they are still champion smokers. After a while, you also pick up on the little things … like obsession with peanut butter. It’s a really funny observation when it first strikes you. Peanut butter is not at all a common food item in France. When you go to the supermarket, you see lots and lots of jellies and jams of every conceivable flavor (including at least a dozen varieties of plums), an entire section of Nutella, more varieties of honey than you knew existed, and chocolate … shelves and shelves of really good chocolate. But you don’t see a lot of peanut butter. It’s still “exotic” here. Little French boys and girls never grew up on PB&J sandwiches the way we did. That’s why, I think, the French are absolutely enamored of this most American of foods. The proof: my luggage every time I travel back from the United States. Continue reading What is it with the French and Peanut Butter?